Small group tour, very authentic experience. 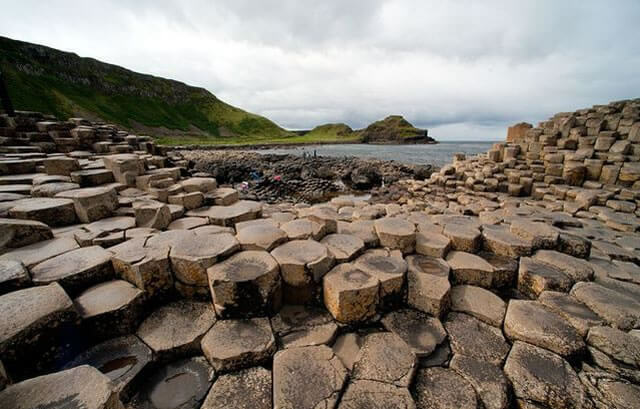 A Giant’s Causeway day tour like no other. Previous customers have regularly reviewed this tour as the ‘highlight’ of their trip to Ireland. 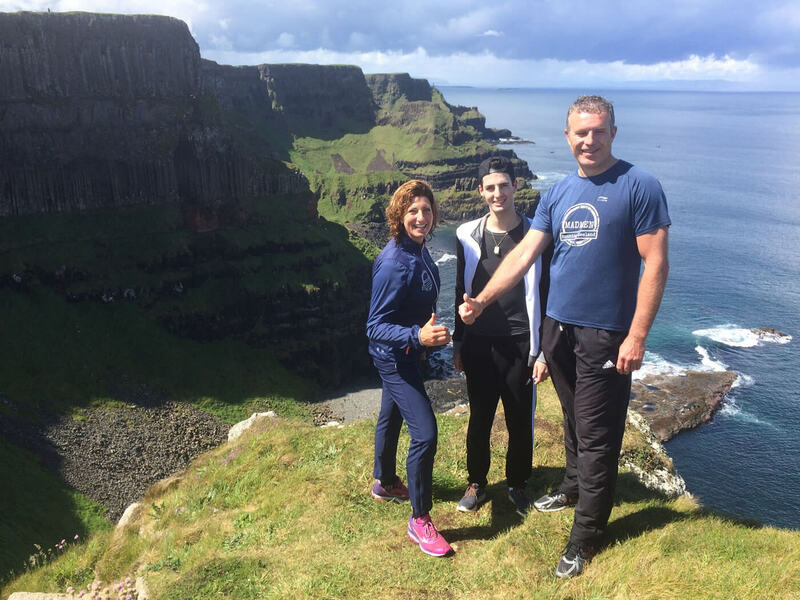 This five mile (8k) guided hike along the spectacular Giant’s Causeway cliff path is a uniquely stunning and authentic experience in what is among some of the best cliff top views in Europe. 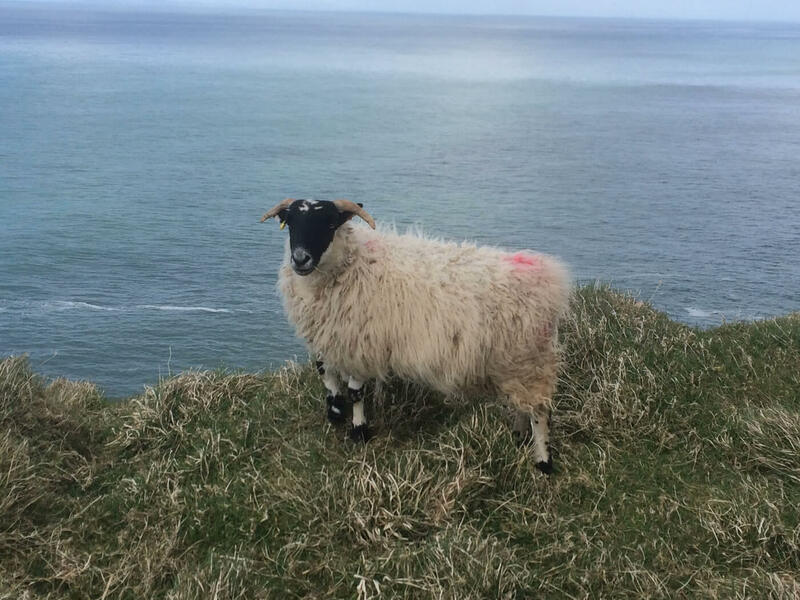 Feel the wind in your hair, hear the waves crashing the shore, watch the gulls dance in the wind, smell the scent of the ocean far below the cliffs, see the sheep grazing right in front of you and bask in the stunning beauty of Ireland’s amazing Causeway coast. All while part of a small group far away from the crowds. Put your walking boots on and let us guide you. Join a small group for the guided hike while also enjoying a luxury coach tour with a larger group from Belfast. 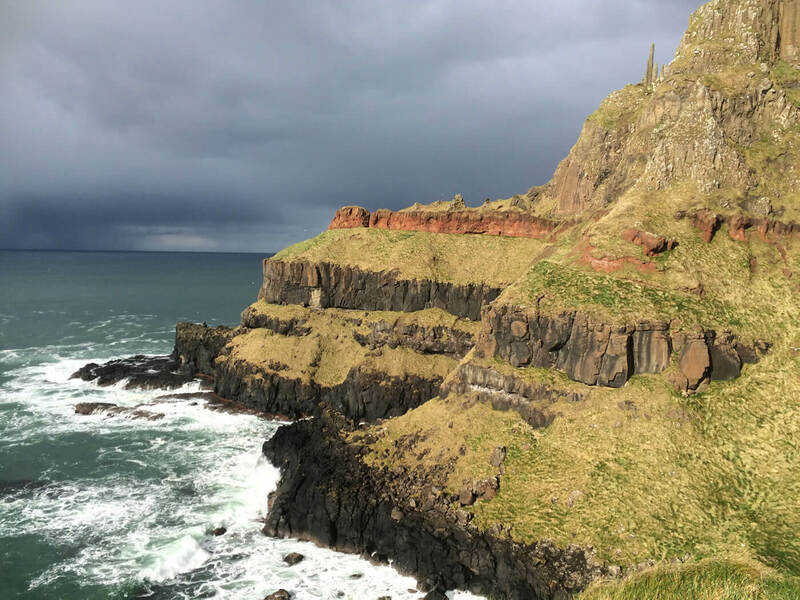 The full day tour includes the guided hike plus visiting the UNESCO World Heritage Site of the Causeway stones, Carrick-A-Rede rope bridge, a stunning drive along one of the top coast drives in the world and a photo stop at Carrickfergus Castle. Departure Time Arrive by 9.00 a.m. for a prompt 9.15 a.m. departure. Wear We strongly recommend good walking boots or shoes. A raincoat is essential, even if it only stays in your bag. Wear light layers that can be added or removed, ideally with something wind proof. Please avoid wearing jeans. Bring A light, portable lunch and water, in a small back pack. Optional seasonal comforts to include hats, gloves or sunscreen! Price £57 per person sharing or £67 for single bookings. Plus a small booking fee. Availability Daily except Mondays and Wednesdays. Bookings must be received no later than 8.00 p.m. the night before. Tours do sell out so we recommend booking as soon as you know your tour date. A selection of reviews from those who have done this tour. See more at Tripadvisor, Facebook or Google. Away A Wee Walk currently holds a certificate of excellence from Trip Advisor. “Quite simply one of the best days of my life”. Lynn Doliett, Facebook. Beginning with a 9.15 a.m Belfast city centre departure, the coach heads inland to the coast and drops all cliff hikers off at Dunseverick Castle ruin (please note not everyone on the coach will be doing the cliff hike). You are met by a local, knowledgeable and passionate walking guide. Over the next three plus hours you will enjoy absolutely breathtaking views along an amazing coastline. The cliff top walk is 5 miles of wonderful, wild and rugged coastal scenery. There are breathtaking views throughout, while walking along mainly grass or gravel paths. The cliff tops undulate along the coast, gradually getting higher. There are stone steps, wooden stiles and ‘kissing’ gates! 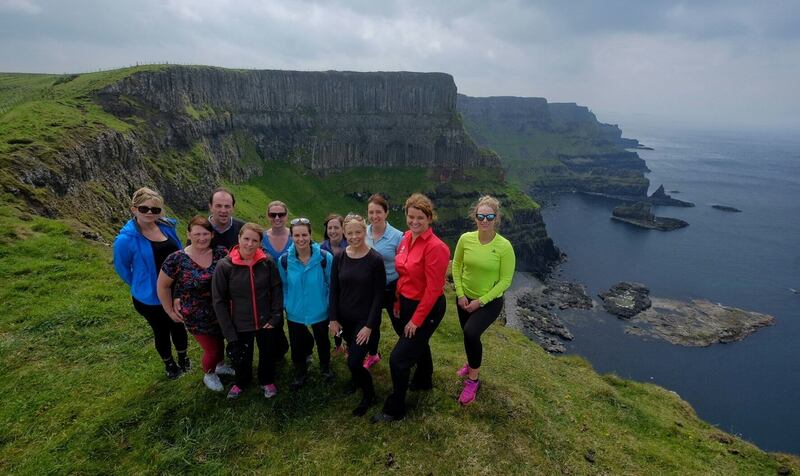 The highlight of the hike is the award winning view from Hamilton’s Seat, which has been compared by some as ‘better than the Cliffs of Moher’. The hike promises to be among the best coastal hikes you will EVER do. Your walking guide will return you to the main coach tour for the remainder of your day. You will go to Carrick-A-Rede rope bridge, (crossing fee included in the tour price). The rope bridge is an exhilarating short walk over a chasm 20 metres across by 30 metres high. The rope bridge has restricted availability but we are delighted to include a (weather permitted) guarantee for you to cross the bridge. You can eat your light portable lunch on the short road journey to the bridge if the weather stops you enjoying a snack on the walk. In the late afternoon relax and enjoy one of the best coastal drives in the world, along the Causeway Coastal Route, stopping for a comfort break, (and ice-cream if you like) before a final photo stop at Carrickfergus Castle (built in 1177) and returning to central Belfast at approximately 6.30 p.m. (5.30 p.m. in winter – please note the coast walk is shorter and on lower paths in winter NOV – FEB due to shorter day light hours). 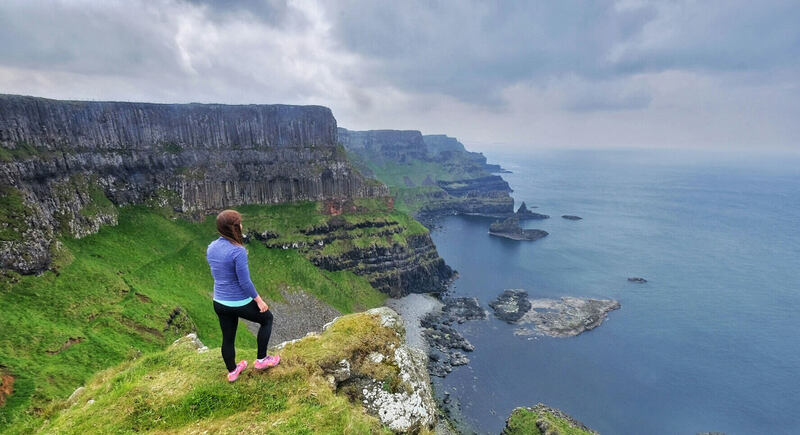 During the cliff walk and the coach tour you will experience magnificent views of the Irish and Scottish coasts, fishing villages, castles, cliffs, beaches and traditional Irish towns. Depart Belfast at 9:15 a.m.
Brief restroom break at Giant’s Causeway visitor centre, entrance fee included, saving you £7.50. 10.30 a.m.
Meet your dedicated walking tour guide from Away A Wee Walk. Cliff walkers dropped off with guide at Dunseverick Castle ruin to begin the 5 mile (8km) cliff hike to the Giant’s Causeway (3 hours and 30 minutes (approx.) includes visit to the Stones, usually of around 20 minutes at the Stones). Rejoin main coach tour and eat packed lunch. Drive through or past Cushendun, Cushendall, Waterfoot and Glenariff along the Glens of Antrim. Stop Carnlough or Glenarm (Restrooms, coffee, ice-cream and photo stop). We do a shorter coast walk of four miles due to much shorter day light hours. Carrick-a-Rede Rope Bridge, ticket included, saving you £4.00 (Restrooms). Coast walkers dropped off at PORTBALLINTRAE (Restrooms) where you meet your walking guide. 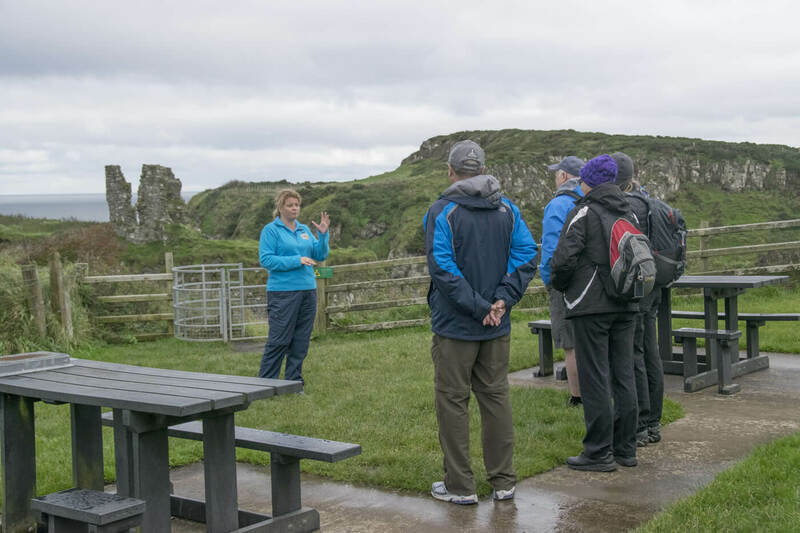 Hikers begin the 4 mile (6.5km) coast walk from Portballintrae to the Giant’s Causeway (2 hours and 30 mins includes visit to the Stones, approx. 20 minutes – winter version excludes highly scenic, high cliff views but includes a beautiful beach walk and lovely coast scenery – high cliff path is too in the winter). Brief comfort stop at Giant’s Causeway visitor centre, entrance fee included, saving you £7.50. The cliff hike is in groups usually between 7 and 14, but never more. Fit enough to enjoy a 5 mile (8k) hike but you don’t need to be a marathon runner. Just about average and make sure you enjoy the outdoors. Do we stop to take it all in? The walking tour is at a ‘walking’ pace between photo and commentary stops. The stops however are frequent and utterly breathtaking. You’ll have great time to soak it all in. Irish! Changeable… very changeable. Pack a light raincoat, wear good walking shoes or boots and otherwise wear layers. We have only done a handful of tours where it has rained the entire time. The wind blows, the sun shines, the rain falls… often all on the same tour! How long do I get at the Causeway stones? Most walking tours will get between 15 and 25 minutes to clamber around the stones at the end of the tour. That is ample time in addition to seeing the Causeway coast. Nope, it is on a coast but that coast undulates. Approximately 200 metres up and down over the 5 miles with the highest point being 116 metres. It is very manageable for most people of average fitness or above. Depending on the weather you can eat a light portable lunch at the best view along the walking route, alternatively you can eat your lunch on the journey to the rope bridge after the walk. Why are jeans not a good idea? Demin is very cold and uncomfortable if it gets wet. We rarely have a lot of rain, believe it or not, however jeans can stay wet for hours after just a short shower. Yes and extraordinarily passionate and experienced. All our guides have a host of training and experience. All guides are first aid trained. Qualifications vary across guides and include Mountain Leadership, Tour Guiding, World Host training and First Aid with an Outdoor focus, plus many others. From understanding the geology to knowing how to get the coast guard if someone hurts themselves, we have the perfect combination of passion and skill. (By the way… so far we have not needed to call the coast guard!). For cancellation up to 72 hours prior to departure date a 15% administration fee will be charged. For cancellation less than 72 hours prior to departure date or a ‘no-show’ the full amount will be charged. Tickets for the Causeway Visitor centre and Rope Bridge crossing are non-refundable and are incorporated into the tour price. Please note, on occasion The Carrick-A-Rede Rope bridge may be closed due to inclement weather. Please note, the walking tour may be adapted or cancelled (rarely) due to very inclement weather. 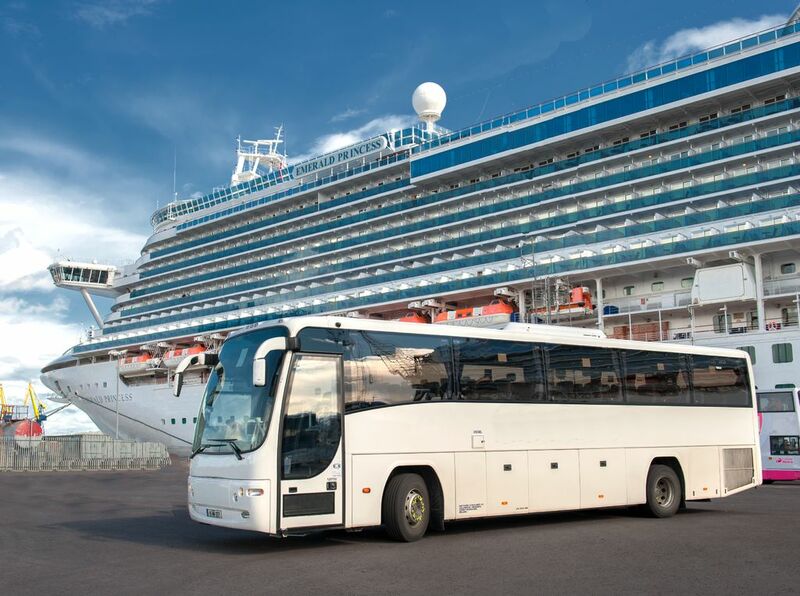 Tour cancellation tends to only occur on two or three occasions in the year in which event we will revert you onto the standard coach tour without the guided hike and will refund your tour to the standard tour price of £33. The winter walk is shorter by 1 hour.